Final Nevada results: Trump 46%, Rubio 24%, Cruz 21%. With Hispanic voters, Trump won 45%, Rubio 28%, Cruz 18%. 8:44: New poll in Texas shows Sen. Ted Cruz and Donald Trump, level at 32 percent. Tight in Texas! 6 days before Super Tuesday. When Ted Cruz quits the race and the field begins to clear, I will get most of his votes – no problem! 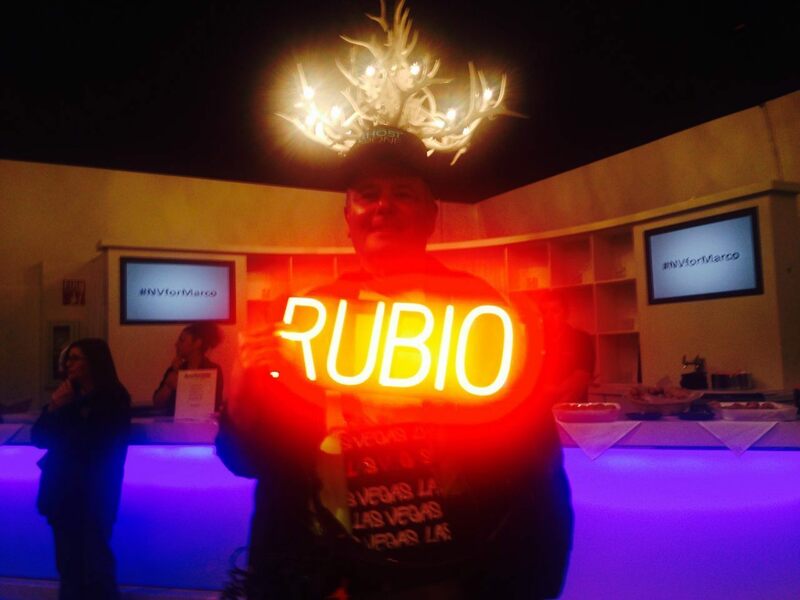 6:35: In Texas, Rubio recalibrate some of his stump speech. He says he has the same message for “Americans of Hispanic descent” as he does for everyone else–to give people the same opportunities their parents had. He says “I know” the concerns Americans have about the economy, student loans, etc. 6:05: Interestingly, Rep. Chris Collins (R-NY) said he had been a Jeb Bush supporter and decided to endorse Trump after Bush dropped out of the race. 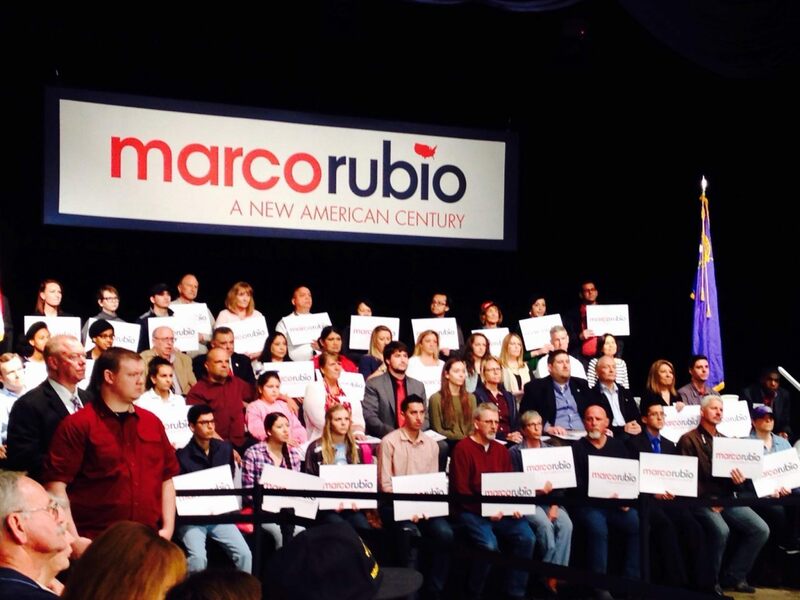 The Rubio rally in Houston started with the Pledge to the Texas flag. As a public school student in Texas years ago, I had to memorize it. Would a Governor Romney endorsement win votes for a GOP candidate? 5:30: With Surrogates like this…. 5:24: Rep. Clyburn predicts a “comfortable win” for Clinton in South Carolina in an interview with MSNBC’s Chuck Todd. “I’m sorry that it didn’t turn out the way that I intended. When I launched the campaign in front of 3-4,000 people in Miami, I anticipated a different result,” an audibly disappointed Bush told donors on a national finance team call scheduled to thank them for their support. 5:02: Clinton says Hillary will stand her ground on Supreme Court nominees. He also accuses Republicans of making things up re: political speech equaling free speech (Clintons adopting some things from Sanders’s playbook). 4:50: Bill Clinton says he went to buy a pair of jeans and a woman approached him to talk about her children in college/college loans. Conveniently, Clinton uses the story to tout Hillary’s proposals re: college loans to appeal to millennials. 4:39: Shortly after the undisciplined Clinton takes a shot at Obama–and his economy–to make himself feel good even though his wife has been diligently trying to tie herself to Obama and his legacy to court critical black voters, Bill Clinton then touts Northern Virginia’s booming economy. In an obvious reference to Trump, Bill Clinton says “America never stopped being great” and “we need to make America whole again.” He says Hillary doesn’t want to build walls and instead build bridges and tear down barriers. Bill Clinton is stumping for his wife in Virginia. He can’t help himself. He takes another passive-egressive shot at Obama, saying so many people can’t see themselves in the picture of the future that Obama painted because they haven’t seen wage increases and the economy hasn’t improved. He says Hillary is running for president to put everybody in the picture. Romney hits Rubio, Cruz, Trump on Fox over not releasing taxes. On Trump: "We have good reason to believe there's a bombshell…"
With less than a week before election day, Donald Trump is widening his lead in Oklahoma’s Republican primary race, according to a poll released Wednesday. The real estate mogul is holding an eight-point lead over Florida Sen. Marco Rubio, with 29 percent to Rubio’s 21 percent, according to the poll. That lead has widened from just 5 percent two weeks ago. The problem with all these “Who made Trump?” accusations from the circular firing-squad is that Trump’s primary victory margins are far too hefty to be explained by factional maneuvers. He’s not winning by a tiny margin that could be portrayed as misguided dupes, and a healthy party doesn’t see its own voters as “dupes” anyway. Trump is winning because a lot of people are voting for him, including voters from demographics the other candidates were supposed to dominate, such as evangelicals in South Carolina and (if entry polls are to be believed) Hispanics in Nevada. Trump’s margins are also far too large to be dismissed as whatever unpleasant fringe movement a particular commentator prefers to blame, from the “alt right” to mischievous left-wingers trying to set up an easy general-election win for Hillary. A lot of the anti-Trump commentary along these lines would be far more plausible if he was only winning by a point or two, but that just isn’t the case. Donald Trump throws a lot of sharp elbows at his competitors, but he doesn’t attack his own prospective voters, the way the Republican establishment and too many anguished conservative opinion leaders do. He says he’s going to fight for them —not in some abstract procedural or aspirational sense, but in a blunt and practical way. He’ll carve them a piece of the pie, bully the crybullies, and slap some sense into the bureaucratic empire sprawled along the Potomac. His voters give him a pass on the details because they appreciate his intentions… which is the ground Democrats usually prefer to fight on. It’s not the national conversation I wanted to have in 2016, but I’d rather try to understand the Republican electorate than insult them into submission, or threaten to stay home and saddle them with President Hillary because they dared to support Donald Trump. Read it multiple times here. Senator Marco Rubio has persuaded wealthy donors, Republican Party elders and his colleagues in Congress that he represents their best chance to overtake the seemingly invincible force that is Donald J. Trump. He just can’t seem to convince the voters. As you may know, Pope Francis recently criticized Donald Trump’s plan to build a wall along the U.S. border with Mexico as “not Christian.” Donald Trump called Pope Francis’ comments “disgraceful.” Who do you agree with more? Would you favor or oppose building a wall along the U.S. border with Mexico? Poll conducted February 19-22. Margin of error = 4.1%. 3:20: Tony Lee: This shows how incompetent the mainstream media, pundits, and GOP establishment operatives are. The type of disaffected voter that Trump has attracted hates both political parties because they believe Republican and Democrats are playing for the same team. They think Trump is someone who is from outside of the political system and beholden to nobody. He is essentially the jackass who will fight for Americans that the media looks down up and the both political parties ignore in favor of whatever the big-monied interests that Trump is not beholden to want. These voters, once activated and all-in on a candidate, are not going to decided not to vote because of a “savagely negative campaign.” A “savagely negative” campaign turns off the No Labels/Goo-goos voters who, like the mainstream media, want politicians to hold hands and sing Kumbaya. The No Labels/Goo-Goos are the people with whom the majority of mainstream media members interact with in their social circles. 3:10: Left mocking Rubio’s surrogates. CNN's @CNNAshleigh says Donald Trump's spouse has some racy past behavior. So far nothing said about Hillary's spouse. Just how effective is it? 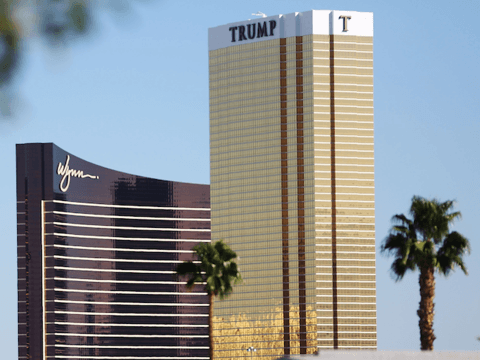 Mr. Trump won the Nevada caucuses on Tuesday. Now, according to a tally published this week by NBC News, three of his Republican rivals — Mr. Kasich, Marco Rubio and Ted Cruz — are spending a combined $1.5 million on television ads in the 11 states holding primaries or caucuses on March 1, known as Super Tuesday. 2:57: Thought experiment: Rubio allies and mainstream media writers who don’t want to concede that Trump won the Hispanic vote in Nevada are endlessly talking about the supposedly small sample of Latino voters. But if Rubio had received 51% of the Hispanic vote, would these same people be pointing to the “small sample size”–or would they be pushing the narrative that Trump can’t even win minorities in his own party? Bottom line: Trump won nearly half of the Latino vote on Tuesday. 2:53: Clinton also brings up voting rights and says this will be one of the most consequential elections in our lifetime. She accuses Republicans of wanting to turn back the clock to a time we want to just see in our rearview mirror.
.@HillaryClinton re water crisis in Detroit: We all know it was not a coincidence this was allowed to happen in a predom black/poor area. Ted Cruz on Abbott endorsement: "Today is one of the greatest honors of my life." Thune on if Trump is front-runner: He's won the last 3 states. So yeah. 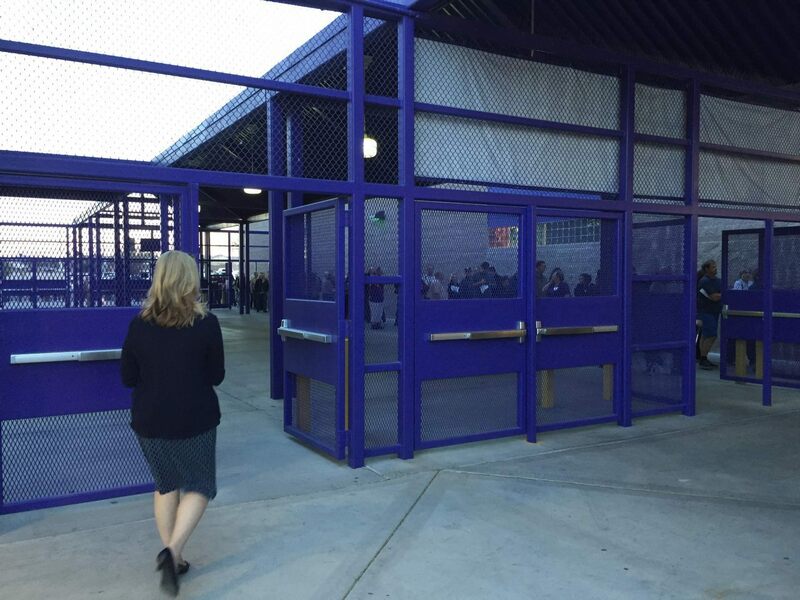 2:06 pm – Cruz arrives for his rally. Williams: What are your opinions on the surprising progress of Donald Trump? Could it be explained by a climate of fear? 1:31 pm – Trump: Fox should fire Karl Rove. In all of television- the only one who said anything bad about last nights landslide victory– was dopey @KarlRove. He should be fired! 1:09 pm – Van Jones, Glenn Beck making same argument against Trump. 1:08 pm – Harry Reid to endorse Hillary. 1:07 pm – Poll shows Cruz with a two-digit lead in Texas. New poll shows Ted Cruz is leading Donald Trump in Texas 35% to 20%: https://t.co/T5NqS0JXqn #tx2016 #txlege More coming soon. “Think for a moment about the major challenges you believe this country faces and tick them off in your mind and ask, ‘Are we making any real progress on any of them?’ Romney said, striking an exasperated tone as he turned to the crowd. 12:46 pm – Consider me intrigued by this analogy. Trump asks audience if they know why Hillary Clinton is praising Obama. "You know why? I know why. She's like a marshmallow." 12:42 pm – Here it comes. 12:38 pm – Internet drama is dramatic. The rich irony of the past few weeks is that the Establishment GOP is attempting to get the “dirty trickster” label irrevocably attached to Ted Cruz and his campaign because they do not want a President Cruz challenging the status quo and exposing all of the true dirty tricks in Washington, DC. Dirty tricks, after all, are the modus operandi in our nation’s Capitol. It is a dirty trick to say you are “reducing spending,” when all you are doing is simply not spending as much as you could have spent or wanted to spend. It was a dirty trick when the Democrats decided to use a procedural technique to “deem” Obamacare to have been passed, even though the Senate and the House never voted on the same bill. And it was a dirty trick for Republicans to campaign on repealing Obamacare, but then simply sit back in Congress while the law went into effect. Americans know what dirty tricks look like, and, quite frankly, we’re sick of them. That’s why Ted Cruz, the anti-Washington candidate, won in Iowa, it’s why Tea Party Patriots Citizens Fund endorsed him, and it’s why the Establishment will do anything to stop him. 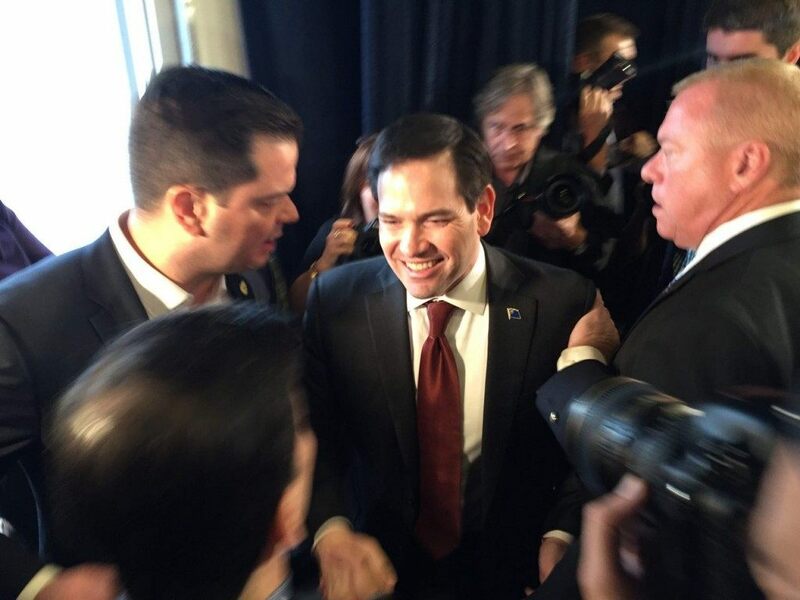 12:17 pm – New York Times: Rubio Gets Party’s Blessing, but Not Voters’. Mr. Rubio’s time — and opportunities for victory — are quickly running out, according to even his own supporters, who are offering increasingly candid assessments of his chances. 11:52 am – Quinnipiac poll checks multiple matchups for the Ohio general election. All top four GOP candidates beat Hillary, and Trump beats Sanders if Michael Bloomberg is in the race. 11:47 am – Rubio gets an endorsement from former U.S. Senator Jim Bunning. In #Trump's America, anyone who doesn’t look or think like Donald Trump would experience more discrimination and more violence. In an interview on Wednesday, Hunter told POLITICO that Trump has the strength needed for the job. “We don’t need a policy wonk as president. We need a leader as president,” Hunter said, adding that he has told his colleagues much of the same thing. “I’m in, and I’ve been in,” he said in a telephone interview. 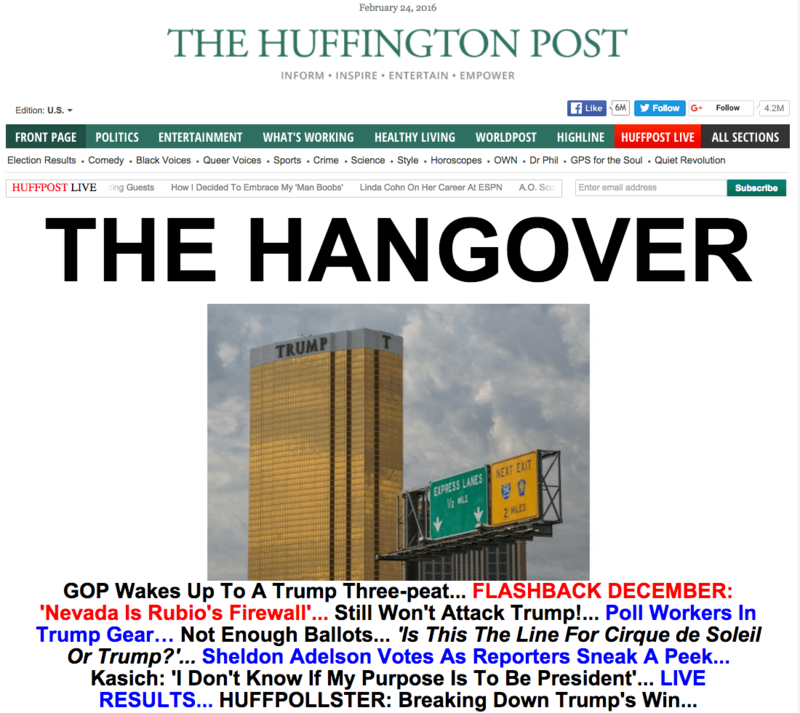 11:33 am – The Huffington Post has some thoughts about last night. 11:30 am – Trump victories by location. 10:22 am – Magnitude of Trump’s Nevada win becoming clear. Trump received more votes than the total GOP turnout in 2012! There’s something happening here, and what it is is starting to become clear. The conventional wisdom remains that the only way for Sen. Ted Cruz (R-TX) to beat Donald Trump is to attack him relentlessly over the next week until Super Tuesday, especially in Thursday night’s GOP debate. That is the same bad advice that has failed for one Republican candidate after another, and which Cruz wisely ignored until January. 9:47 am – Texas Governor Greg Abbott endorses Ted Cruz. 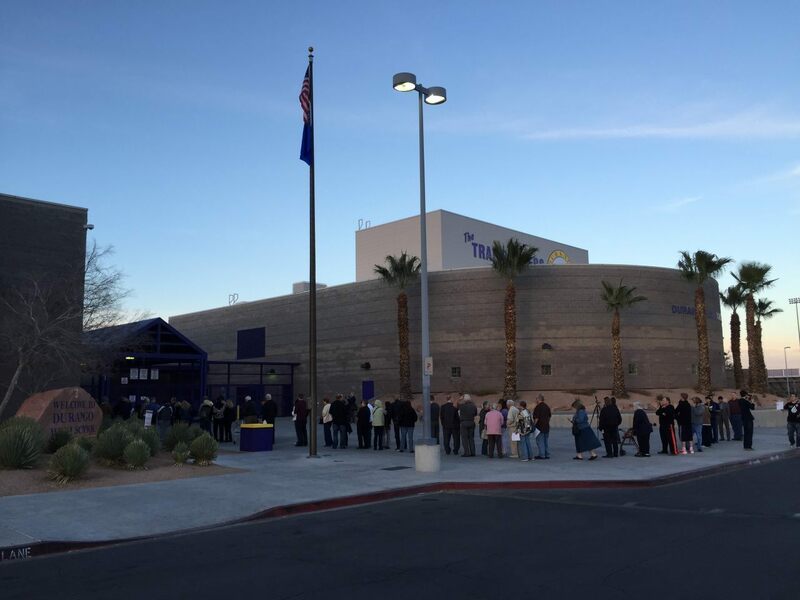 9:33 am – Massive record turnout for GOP in NV. Dem turnout crashed. 9:21 am – MUST READ: How Trump beats Hillary. 9:05 – Trump surges to statistical tie in Cruz’s home state of Texas. 8:51 am – During an appearance on third place New Day, RNC Chair Reince Priebus mocked the Washington Post. Rubio plan, apparently: No need to win IA NH SC NV TX GA VA TN AL AR OK CO VT MN MA MI. Game starts in FL 3/15. Feels a little like Rudy 08. As the Republican primary campaign continues, Sen. Marco Rubio has refused to play an expectations game while his opponents question which state he could possibly win. But the Florida senator finally predicted a win in his home state, during an interview Wednesday morning. “Well, we will with win in Florida, now that Governor Bush is no longer in the race,” Rubio said, noting that a lot of the former governor’s support had gone to him. LAS VEGAS, Nevada —Sen. Ted Cruz (R-TX) is looking to Texas to re-launch his campaign, as early voting in the candidate’s home state has already logged 500,000 votes, Lieutenant Governor Dan Patrick.told Breitbart News Tuesday night. “This race is getting down to two people. Rubio doesn’t have a pathway to victory,” Patrick said. Senator Marco Rubio dismissed repeated questions about when he would finally attack Donald Trump with gusto to halt his momentum in the Republican presidential race. Rubio said he would continue to point out his differences with Trump, citing the last Republican debate where Trump suggested that George W. Bush was responsible for 9/11 as an example. Donald Trump made an impromptu stop at a caucus site in Las Vegas where Glenn Beck was appearing on behalf of his candidate, Sen. Ted Cruz. Trump entered the site at the exact moment Beck was Cruz. As soon as the word dropped caucus-goers mobbed the door to see the candidate make his entrance. 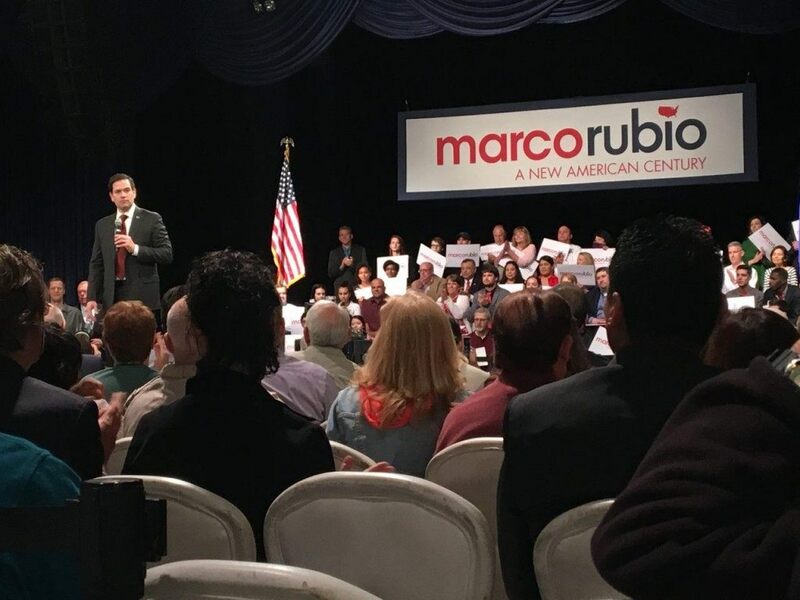 7:29 am – Rubio guarantees a March 15 win in Florida. 7:21 – Scarborough speaks the unspoken: Rubio not attacking Trump because Rubio wants to be Trump’s VP. Bonus: Rubio helps Trump in must-win Florida and with Hispanics. 7:16 am – 2016 in a nutshell? 7:09 am – PredictWise opens with Trump at 68%, Rubio at 40%, everyone else at 1%. 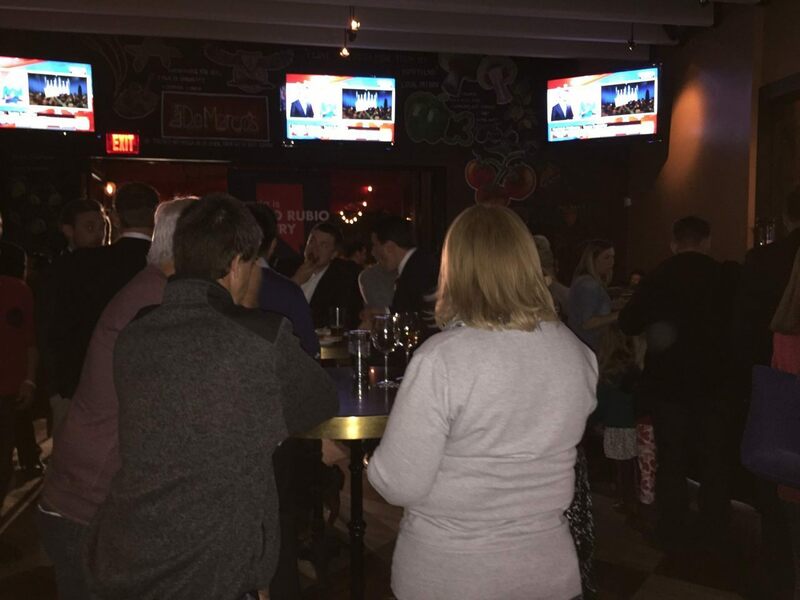 7:07 am – Everyone is calling for Cruz and Kasich to step down in order to make way for Rubio. This makes little sense. Kasich could win his home state of Ohio. Cruz is ahead in his home state of Texas. These are both big states. Currently, Rubio does not lead in any big state, including his home state of Florida. 6:45 am – With 100% reporting, Trump has won Nevada with 46% of the vote. Marco Rubio came in a distant second with 24%. Ted Cruz earned a close thirds with 21%. Bottom line: In a record turnout, Trump beat second and third place combined. 1:15: None of the networks are televising whatever Beck may be babbling on about. Late at night, Democrats like Van Jones reveal inconvenient truths they often try to hide. Last week, Jones said that black Americans may support Trump in the general election. Today, he said on CNN that Democrats need to take Trump seriously because he can make it all the way to the White House because he is opposing the Trans-Pacific Partnership deal and fighting for fairer trade deals for American workers. 12:53: Trump says “we’re going to be celebrating for a long time tonight. So have a good night.” Trump says despite what the pundits were saying, now we’re “winning, winning, winning” and soon the country is going to start “winning, winning, winning.” He thanks his volunteers for working endlessly. “We’re not going to forget it,” he says. Trump cites his amazing numbers out of Texas, Georgia, Arkansas, Florida. Trump proudly states he won with 46% of Hispanics. He says Mexico will pay for the and we will be the “smart people” who won’t get pushed around. He promises that you’ll be proud of your president and country. Trump: A steamroller on a shoestring. The opposite of Jeb Bush in virtually every respect. 12:27: Oh shut up! Failed GOP consultant who has never won a presidential election and just blew $100+ million on Jeb!’s failed campaign (while reportedly pocketing at least $12 million for himself and even more for his cronies) should be prohibited from offering any opinions during this election cycle. Will say it again: Going to him for advice is like getting advice on how to sink free throws from Messrs. Jordan (DeAndre), Howard, and Drummond.
.@DavidChalian on the “wow number” — Trump winning Latinos 44 percent. Donald kept saying he’d win Latinos. Many people laughed. But look! Marco Rubio is in Michigan this evening after rallying with supporters earlier. Not expected to speak. 12:06: Wasn’t GOP establishment darling Rubio the one who was supposed to get “across the board” support? 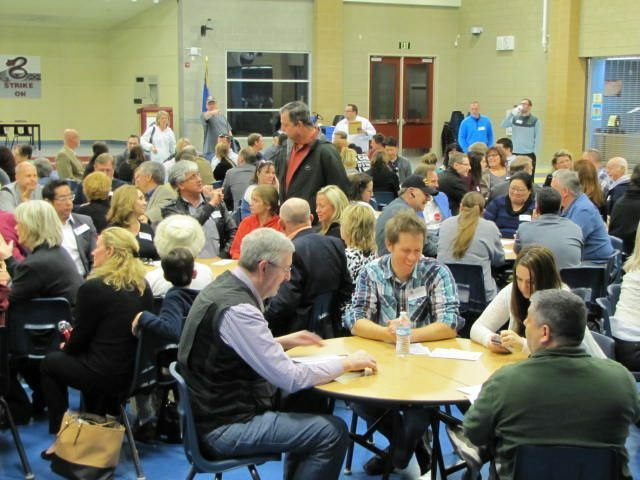 LAS VEGAS, Nevada — Friends and neighbors debated the Republican candidates’ pros and cons at the Nevada caucuses at Durango High School on Tuesday evening, with hundreds standing patiently in line to cast their votes and hear from representatives of the different campaigns. 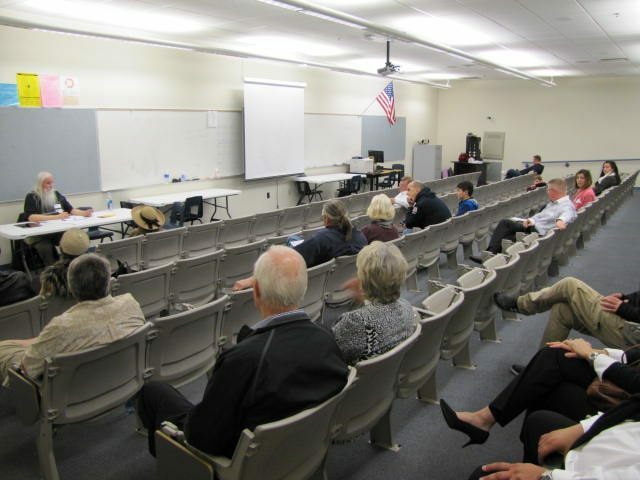 The atmosphere was festive, with an eclectic variety of caucusgoers actively engaging in political conversations about the candidates and the issues. 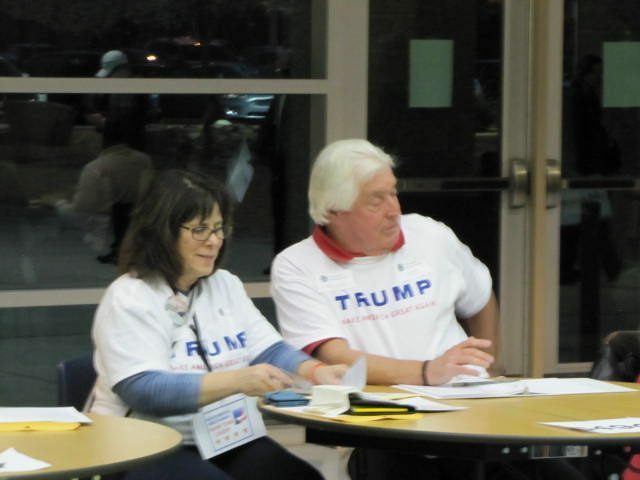 Since the caucuses are not decided through a secret ballot, but through deliberation, there were few restrictions on campaign paraphernalia worn by attendees–or by staff. 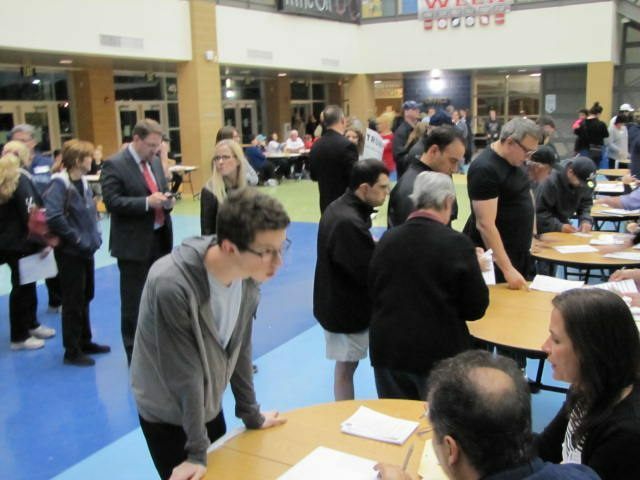 LAS VEGAS, Nevada— Eager Republican caucus-goers filled the cafeteria and classrooms at Desert Oasis High School Tuesday evening to cast their ballots in the nation’s fourth presidential nominating contest. 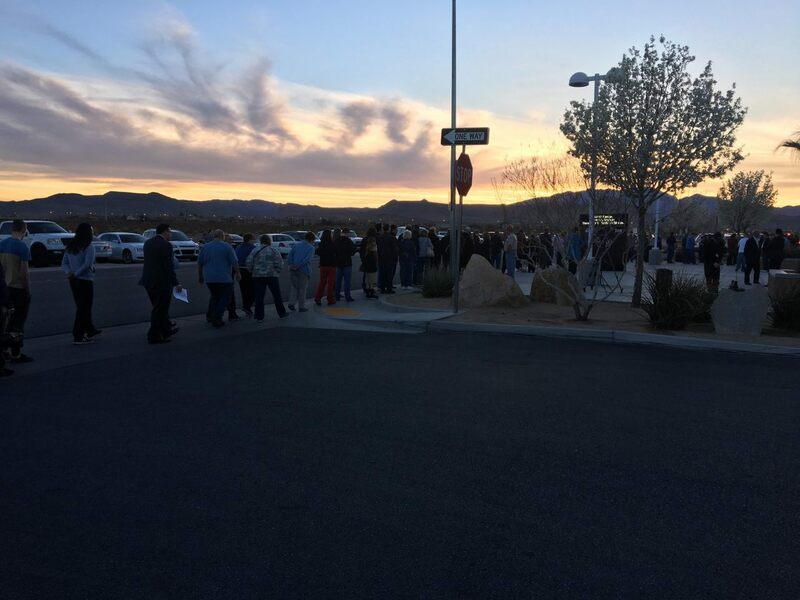 Long lines formed outside the school ahead of the 5 p.m. start time, and many of the hundreds of Nevadans in attendance told Breitbart News that they had never participated in a caucus before. Some of the nastiest people I have ever been with. (Trump supporters). We have their hate and rage on tape. Others around them were embarrassed for them. It was scary and sad. I believe Trump, whether he knows it or not, is grooming brown shirts. Remarkable words coming from this Glenn Beck. 10:57: Cruz campaign telling CNN reporters that they will be happy with a third-place finish. 10:50: Nevada caucus results will trickle in here. John Kasich’s relentlessly positive stump speeches can often feel like motivational seminars. But on a rainy Tuesday night in Georgia, the man it sounded like Kasich was trying to motivate was himself. 10:34: CNN: Cruz camp lowering expectations. 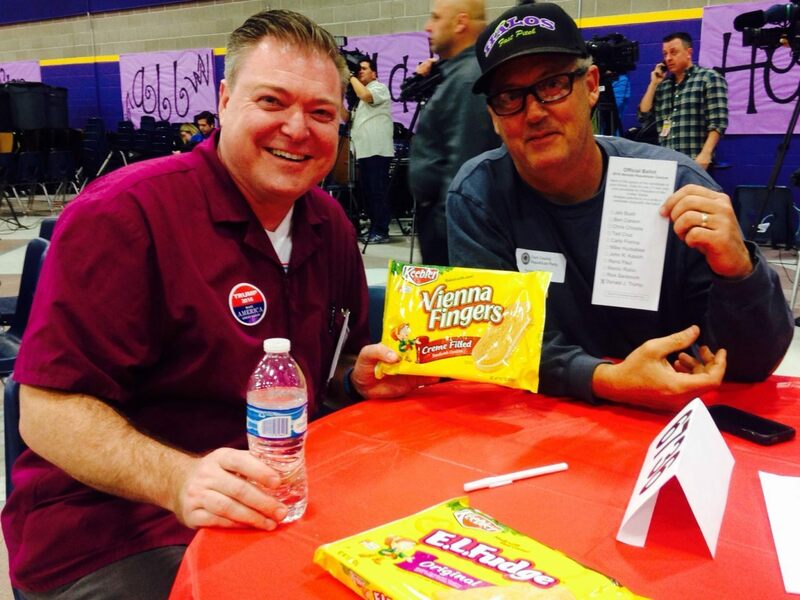 CNN’s Brian Todd–most people at Desert Oasis High School caucus site are for Trump. What @MonicaCrowley was just saying on #Hannity is a BIG DEAL. The Establishment is going down in flames. #GoodTimes2016! 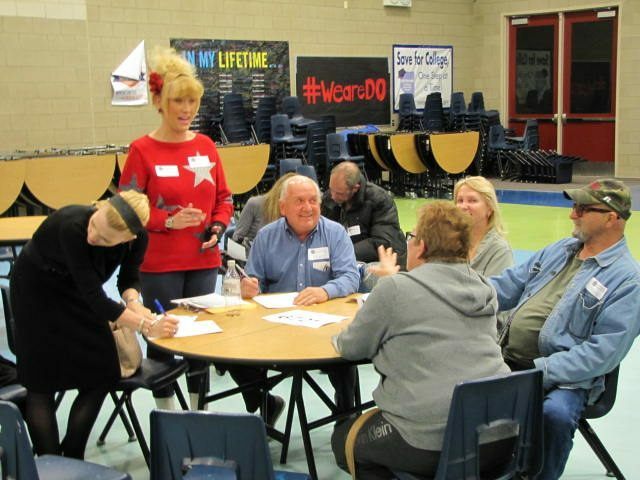 @MarcACaputo Nevada holds caucuses, not a primary election. 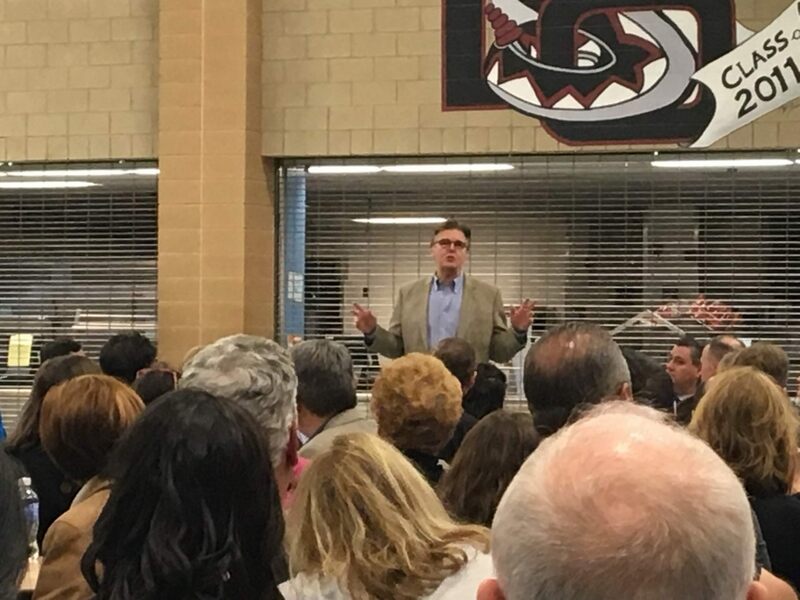 Candidate swag is OK.
Texas Lt. Gov Dan Patrick is Cruz surrogate at Desert Oasis High School: Cruz is “only conservative” in the race, he says. Two-minute speaking time limit strictly enforced. Donald Trump crashed the caucus location where conservative talk show host Glenn Beck was speaking on behalf of Ted Cruz. MSNBC was broadcasting a live look at the caucus site, Palo Verde High School in Summerlin, when Trump suddenly showed up and made an impromptu speech of his own. 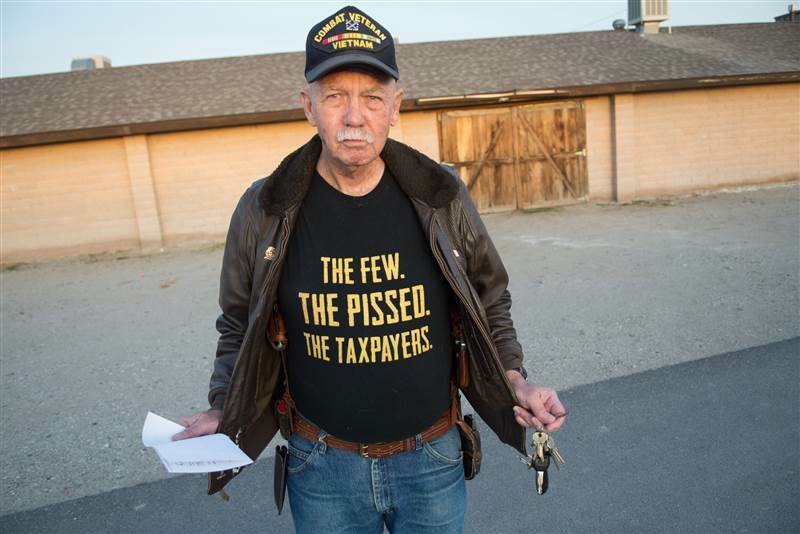 The billionaire informed his Twitter followers he would be “at various caucus sites” throughout Nevada Tuesday, but didn’t specify where. 9:54: Cuomo, talking about the Ginsburg-Scalia friendship, asks Clinton who is her Scalia. She says Scalia and Ginsburg actually got to spend time with each other and get to know each other as people. She laments that lawmakers don’t get to do that now. Clinton says she looked for opportunities to work across the aisle when her husband became president. She says she worked with Tom DeLay and Lindsey Graham. She says relationships underlie everything. She answers people like John McCain/Susan Collins. 9:48: South Carolina’s poet laureate asks how she will harness the power of forgiveness. Clinton says she could not be standing here if she had not been forgiven many times and if she had not been able to forgive those who had disappointed or wronged her. She talks about the Truth and Reconciliation Process in South America and speaks about the time she spent with Nelson Mandela. She said it was a stunning example of “what is possible” and we could do a lot more if we could “harness those feelings.” She says she sees so much “anger” and talks about “violent images” and “threats against people” that are “deeply troubling” to her. Clinton says more people should walk in other people’s shoes and being more forgiving is one of our biggest challenges. 9:45: Charter school founder asks Clinton if our students are put at a disadvantage because international students go to school for 40 more days a year than American students. Clinton says we need to focus on disadvantaged, low-income kids and those with learning difficulties because they need more time to learn. 9:42: Questioner asks Clinton about funding Social Security. She says she will prevent Republicans from privatizing it and that has to be the highest priority. Regarding the trust fund, Clinton says “we have to go where the money is” and “have to look at different ways to get more money into the trust fund.” She suggests raising the cap or expanding the Social Security tax to passive/investment income. 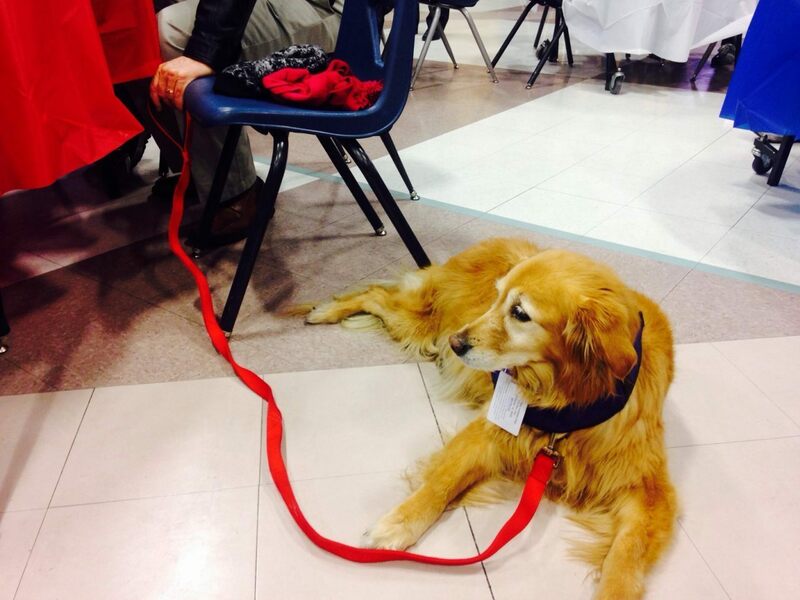 She says she will do everything she can to extend the life of the trust fund. She says there are a lot of low-wage workers, women who were not in the formal workforce who don’t get enough benefits to get by. Clinton says we also need to be concerned about widows who lose half their benefits when their husband dies. Clinton says she has turned over 55,000 pages of emails and claims that nobody has ever been as transparent/open as she has and says she is “not at all worried about it.” That’s it, folks. We’ve asked what we had to ask and let’s go to the audience. No grilling at all. 9:30: A questioner asks what she would do to help strengthen families. Clinton says a lot of families are trying to keep “body and soul together” and are under tremendous economic stress. She speaks about raising the minimum wage and equal pay. She says we should do more to help support families as they raise their children. She touts her “It Takes a Village” book and says the community/extended families should help families do right by their own kids. She speaks of more early childhood education and universal pre-K programs. 9:24: Clinton says what she got out of going to Wellesley was that women ran everything. She says she is grateful for the experience and was grateful to the women who had been in the Senate before when she got to the Senate. She says there was a bipartisan group of women who regularly met to discuss trivial things like what to do with their handbags and more serious things like women’s issues, childcare, equal pay, etc. Just talked to a democrat who registered gop for fun and is voting for Kasich–"he's, like, the only normal one"
9:19: Cuomo says that a lot of law enforcement officers found Beyonce’s Super Bowl performance offensive and asks Clinton if she understands where they are coming from. Clinton says most police officers perform honorably but “we have problems in our criminal justice system in a lot of places that we can’t ignore.” She says put aside any particular celebrity/song or performance and cites instances like Walter Scott in South Carolina. She says the answer is not to find ourselves in opposing camps where we look at each other with “mistrust.” She says police should be trained to use force as a last resort. She doesn’t answer whether she understands where the police officers who were opposed to Beyonce’s performance are coming from. 9:17: Clinton says Jim Crow is “unfortunately alive and well.” She says there are places in South Carolina where black babies have a higher rate of dying than in a lot of other places. She says the infant mortality rate can be compared to those in some third-world countries. She blasts Haley for not accepting Obamacare’s Medicaid expansion. Clinton tells the questioner that she has the right to wear her hair any way she wants to and that’s her right. Clinton says that she herself has had a lot of different hair styles. 9:15: An African-American woman question asks Clinton that recently she has started to wear her hair “natural” and says there have been a lot of racial tension recently. She cites the reaction to Beyonce’s Formation video (remember: CNN chose these questions to be asked)…. Clinton says we have to deal with “systemic racism” that is found in the criminal justice system, education, housing. She says “systemic racism” is also cultural and asks the five women who have lost children to “senseless gun violence” and police action to stand up. Trayvon Martin’s mother and four others campaigned with Clinton earlier in the day and they are with her at CNN’s town hall in the audience. She says it is important for white people to realize that their experience may not equip them to understand what African-American citizens go through every day. 9:10: Cruz fires back at Trump. 9:08: Questioner asks Clinton how she would contain the sectarian violence that would ensue if Assad is toppled. Clinton says that in Syria, it looks like there will be a cease fire by the weekend. She rambles and says the international community should give them some “time and space.” When asked if her Libya policy was a mistake, Clinton talks about the Nato/Arab nations coalition and defends America’s use of “our special assets” to help Libya. Make sure you get on the Trump line and are not mislead by the Cruz people. They are bad! BE CAREFUL. Clinton says Obama took an enormous amount of money from Wall Street and pushed through Dodd-Frank. 8:54: Sanders says he has known Clinton for 35 years and he respects and likes her. He says “we’re not Republicans, after all.” Sanders says “a very few people” control our political/economic systems and it is “too late” for establishment politics/economics. He says we need a revolution where millions come together and demand a government that represents all of us. 8:53: Sanders is asked if there is something he believes so deeply that he would rather lose an election rather than win and compromise on it. He says that’s a “fair question” and says he will try to do his best to run a principled campaign and not let his supporters down. He says he wants to fight for people who don’t have a lot of power and take on those who abuse power. 8:50: Sanders is asked what he believes in re: religion/spirituality… Sanders says every great religion in the world comes down to “Do unto others as you would have them do unto you”…. Sanders says it is easy to turn our backs on veterans sleeping on the street or children who are starving but when we do the right thing and treat people with respect and dignity, “I think we are more human when we do that.” He says that is what he believes in. And most people around the world share that belief. 8:46: Questioner, who lost his father to lung cancer, asks Sanders about cigarette smoking and wonders what reforms Sanders would put in place if elected president like raising the minimum age for purchasing tobacco products. Sanders says he doesn’t know if he would go in that direction but says cigarette smoke contributed to his father’s death. Sanders says the tobacco industry epitomizes corporate greed. He blasts them for having pretty girls giving out tobacco to kids around the world like heroin. He says he will do everything he can to help low-income people find the treatment that they need to help them get off of cigarettes. Sanders says taking on the tobacco industry is something he will enjoy doing very much. 8:45: Sanders says his goal will be to spend healthcare funds on healthcare for the American people instead of on bureaucracy. 8:44: Sanders says he won’t be beholden to special interests and again asks why these interests donate millions candidates. He says his average contribution is $27 and those are the people to whom he is indebted. 8:42: Sanders names Bill Gates when asked if there are any billionaires he admires. He says Gates is trying to make the world a better place. He blasts the Koch brothers for undermining American democracy. 8:41: Sanders says he has never gone around telling voters that he will solve all their problems. He says that he has repeatedly said that “together” we will fix the country’s problems. 8:31: Sanders is aske what two leadership truths would he share with her undergraduate students. Sanders says you cannot be a good leader unless you go into your heart of hearts and passionately believe in what you believe. He says people have to be ready to fight for what they believe in. 8:30: Sanders says we need to have the guts to take on the insurance, pharmaceutical industries with their armies of lobbyists to get his Medicare for all plan enacted. 8:24: Sanders tells a questioner that there has been a massive transfer of wealth from the middle class to the top 1/10 of one percent. He says it is time for Wall Street to help the middle class. 8:19: Sanders is asked about Supreme Court Justices. Sanders blames Republicans for wanting to obstruct Obama since he came into office. He says the latest effort to block Obama’s potential nominee to replace Scalia is part of a “continuous” and “unprecedented” obstructionism effort. Sanders says Thurgood Marshall was a great Supreme Court Justice. Sanders accuses Republicans, birthers, and Trump of a “racist” effort to delegitimize Obama. Sanders says his dad came from Poland but nobody is asking his birth certificate. When Cuomo asks if Trump is motivated by race, Sanders punts and says he is not a psychoanalyst. He says “absolutely” there is race involved in parts of the GOP base. 8:17: Cuomo asks Sanders why his message has not been resonating with black voters. Sanders says his message wasn’t resonating with anyone at he beginning of the campaign. He says African-Americans are becoming more receptive to his message of investing in jobs and education and “not jails and incarceration.” Sanders says he has specific ideas on how the federal government can play a “major role” in ending the militarization of local police departments and ensuring that they look more like their communities. 8:14: Questioner asks Sanders how private historically black colleges and universities will be impacted by his plan for free public college for all. Sanders says he believes historically black colleges and universities play “an important role” and we should make sure that “we must sustain and strengthen the historically black colleges and universities.” Sanders says “you have my word” that we will increase funding to historically black colleges and universities… Sanders says they are under a lot of financial pressure because they do the right thing and welcome kids that Harvard and Yale may not welcome. He says those colleges deserve very strong support. 8:12: First questioner, an African-American woman, asks Sanders whether he would allow staff/teachers to carry guns in order to defend the students. Sanders says he has D- NRA rating. Sanders says he would not be supportive of people taking guns into houses of worships if he were a governor. Sanders says “we have got to do everything we can do expand and improve instant background checks.” He says those with criminal background and are mentally unstable should not get guns. 8:11: Sanders is asked about Obama’s plan to close GITMO. Sanders says we look like “hypocrites” and “fools” to the entire world by locking people up in an island. He says that has hurt us all over the world. 8:10: Sanders is asked about his comments about how the CIA is a “dangerous” institution. Sanders says that was 40 years ago and he has concerns about the past activities of the CIA in Iran and Chile. He says the CIA plays an “important role” but they have done things they should not have done on behalf of the United States. 8:00: Nevada’s GOP caucus begin as Hillary Clinton and Bernie Sanders participate in a South Carolina town hall event on CNN. 7:50: Breitbart News Senior Editor-at-Large Joel Pollak’s impromptu interview with Donald Trump Jr.
U.S. Sen. Ted Cruz is about to become the first Republican presidential candidate to drop real money in Atlanta, with a $400,000 TV campaign that starts Wednesday, six days before the SEC primary. He may also be purchasing airtime elsewhere in the state. The size of the Atlanta buy is significant – the average viewer will see his message 10 times by next Tuesday. Finally, Conservative Solutions PAC, which supports Florida U.S. Sen. Marco Rubio, has spent $350,000 on nearly 300 sots on all four major Atlanta stations. According to FCC records, most of the ads will run during local news broadcasts, game shows and late-night talk shows, with a few popping up on “60 Minutes” on CBS. 7:05: Rep. John Lewis (D-GA) stumped for Clinton in Georgia while it looks like Sanders is pulling out of the Southern Super Tuesday states and putting his resources into five non-Southern states. Every man who embodies what we are fighting against has come out to endorse Rubio over the past 48 hours. Road Weary? Marco Rubio ends Minneapolis speech: "Thank you Michigan! Er… Minnesota!" Club for Growth is the group that came to my office seeking $1 million dollars. I told them no and now they are doing negative ads. 6:25: Can Cruz pull off the upset? Will be interesting to see if Cruz SuperPAC, which deployed ground troops to knock on doors, aired TV and robocalls, can change race in NV. Cruz just now in NV–>"I'm not willing to gamble my daughter's future on Donald Trump." This will be Trump's fourth trip to Texas as a presidential candidate and his third campaign event here. 5:50: Rep. Pete King endorses Rubio. “Republicans can’t afford to forfeit this race to Hillary Clinton by nominating the wrong candidate,” King said in a statement. 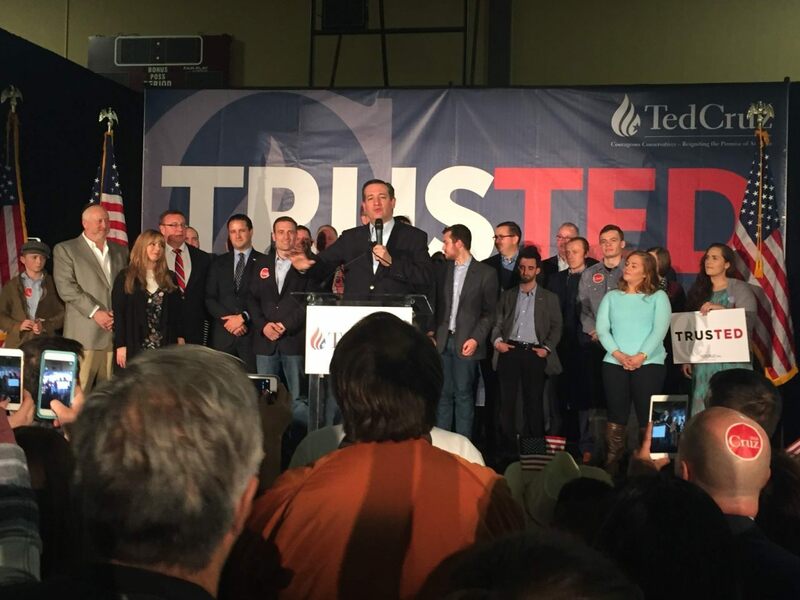 LAS VEGAS (AP) — Ted Cruz is fighting to keep from spiraling out of contention. Marco Rubio is fighting to prove he can build on his recent momentum. And Donald Trump, with his rivals locked in a battle for second, is fighting for a third straight victory to expand a delegate lead that could soon become insurmountable. Tuesday night’s Nevada caucuses force a critical test on the Republican Party’s leading presidential candidates. Cruz, a fiery conservative popular among voters on the GOP’s right, needs a spark to recover from one of the weakest moments of his campaign. After denying charges of dishonest tactics for several weeks, the Texas senator on Monday asked for and received the resignation of a senior aide who spread an inaccurate news report suggesting Rubio had criticized the Bible. That was just days after Cruz finished a disappointing third in South Carolina after spending much of the past two weeks defending his integrity. 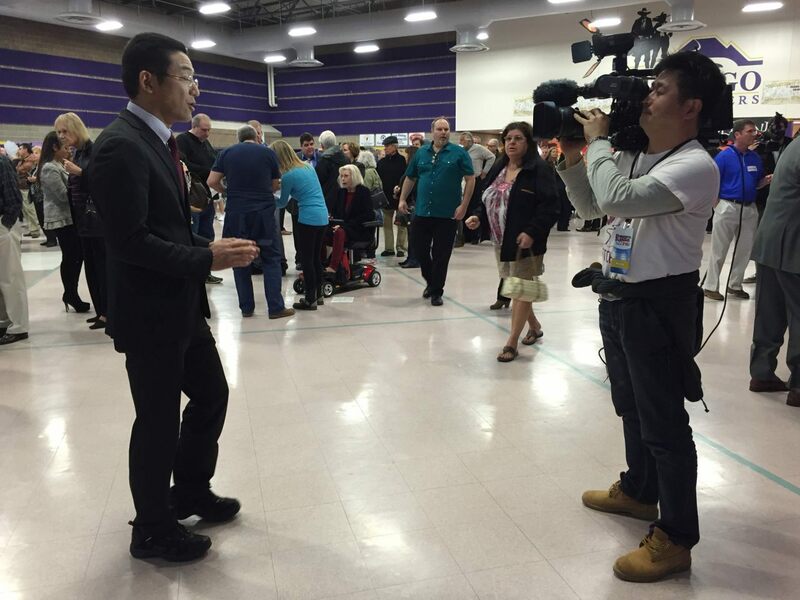 Another disappointing finish in Nevada’s low-turnout caucuses would raise new questions about Cruz’s viability heading into a crucial batch of Super Tuesday states on March 1. Rubio is planning to meet with his former political mentor Jeb Bush to try to bury the hatchet, the Florida Senator says. Speaking to reporters in Nevada today, Rubio said that he spoke with Bush on Monday and had “a nice conversation,” according to the New York Times. Ted Cruz: "The Trump campaign tweeted out a made-up quote from Senator Coburn impugning my integity…and yet there's been no apology." Ted Cruz: "At the end of the day, bearing false witness is what we are seeing both the Rubio campaign and the Donald Trump campaign do." 5:14: Uh oh. Gonna be a late night! 5:08: Former governor of Puerto Rico endorses Rubio. 5:06: Steve King says Cruz’s apology to Carson is a mistake. The result, writes Norton, has been a “jockeying for stigma” among various identity groups, a competition for victimhood into which Trump has tapped. From my African-American perspective — and that of Bartlett, who happens to be white — it is preposterous to see whites as marginalized and powerless in America after centuries of advantages. Yet it is neither wise nor fair to dismiss Trump’s voters as racists. Many see themselves as victims of a system that deliberately has overlooked their concerns about immigration, trade, education costs and other issues that have buffeted their lives. Bernie Sanders’ campaign will clarify an incorrect fundraising email they sent Tuesday morning that claimed Hillary Clinton’s campaign was charging “some donors” $27,000 to attend a fundraiser in Los Angeles on Monday night. After sending the email Tuesday, Mike Casca, Sanders’ rapid response spokesman, acknowledged the email needed clarification. “Our supporters are really fired up about Clinton’s high-dollar fundraising, so when we send another fundraising email about it tonight we’ll be sure to clarify that the high-dollar donors ‘bundled’ instead of ‘donated’ $27,000, which is more than the annual salary of a worker making $12 per hour,” Casca said. 4:39: The mothers of Eric Garner, Trayvon Martin, and Sandra Bland will join Clinton at a South Carolina town hall event. Clinton and Sanders will also meet at a CNN town hall event at 8 PM EST. 4:21: Trump blasts Hillary for making a statement about “sexists.” “She had a rough week with her husband,” Trump says, adding that the “last person” Hillary wants to run against is him. 4:20: Trump says “Hillary needs energy” and again points out that she lacks the stamina to be president. 4:17: According to CNN, the Clinton campaign reportedly has a DDD strategy to diminish Sanders as a single-issue candidate, define him as someone with pie-in-they-sky proposals, and defeat him. 4:15: Trump rails against lobbyists who target people like Cruz and Rubio. He says it was a “disgrace” that GOP debates have been stacked lobbyists backing establishment candidates. Trump says he only had his family in the audience because he is self-funding his campaign. BREAKING: Huge news for NV caucus. GOP official confirms that 37,000 have pre-registered. That's bigger than overall turnout in 2012! 4:11: Trump says Hillary “wants to destroy the Second Amendment.” He says he likes debating New Yorkers about the importance of the Second Amendment and they “lose that debate every single time… they can’t win that debate.” Trump says nobody is going to mess around with the Second Amendment. 4:09: Trump blasts Macys for being more interested in being “politically correct” than what’s good for the country. Trump says “political correctness” is killing this country. 4:00: Trump says he loves “knocking off bad people” and it was an “honor” to beat Cruz in South Carolina. Trump also cites his support across a broad swath of the GOP electorate. 3:57: Trump says Cruz has never employed anybody. He says he would really like to win in Texas. “I love Texas,” he says. Trump says Cruz is going to go “way, way down” in Texas because he has been exposed as a liar. 3:55: Trump says everybody “is taking advantage of us” because we have “incompetent” leaders. 3:54: Trump blasts former Mexican president Felipe Calderon for saying Mexico will not pay for the border wall. Trump says “they will pay for the wall.” He says the wall will be impenetrable. 3:53: Trump says having Sarah Palin’s backing has been “so great.” “She’s been so great.” He also says he will be the greatest jobs-producing president that God has ever created. 3:52: Trump says Christianity is under assault. He says evangelical leaders have said that Trump may not be perfect, but evangelicals want a leader like Trump. He praises the Falwells for building Liberty University. 3:51: Trump says he has spent less and he is number one. He says wouldn’t it be a good thing to have a president who spends less and becomes number one. He brings up education spending and says wouldn’t it be nice if America spent its education dollars more effectively. 3:50: Trump says he is not sending back small-dollar donations that come with four-page letters because “there is no way” you can send it back nicely. 3:47: Trump says he cares about one thing–“making America great again.” Trump says he doesn’t get enough credit for self-funding his campaign. 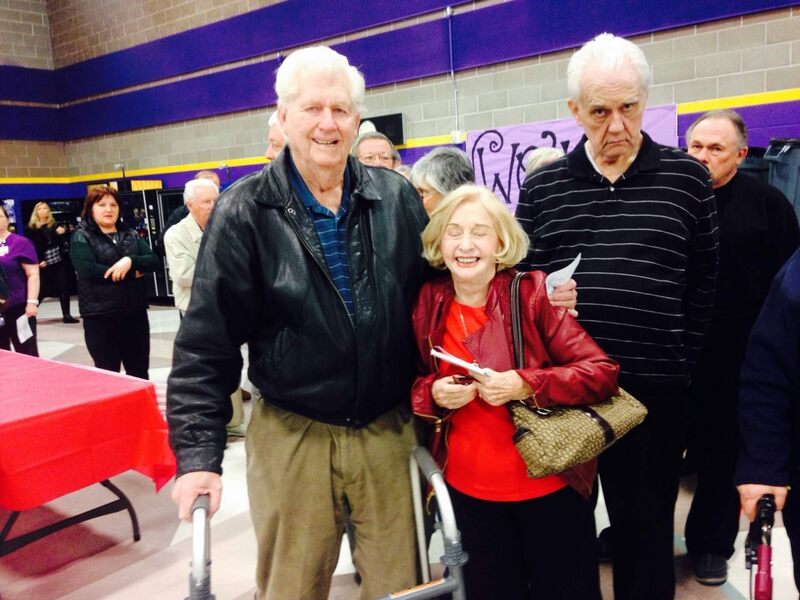 “When you go to the voter booth, I hope you remember that,” he says. 3:43: Unlike Obama Trump says he will only have State dinners for countries that treat America well. 3:36: Trump blasts failed GOP establishment strategist Stuart Stevens for giving “advice” on how Republicans can beat Trump when Stevens’s candidate Mitt Romney could not beat Obama. Trump says his hands shake and he sweats every time Trump is mentioned on air during Stevens’s appearances. Nevada is one of the most racially and ethnically diverse states in the country and in Tuesday’s Republican caucuses, that could favor Donald Trump. That idea may sound counter intuitive. After all, in polls Trump fares especially poorly with minority voters. In the latest NBC News/ Wall Street Journal poll, only 13 percent of African Americans and 15 percent of Hispanics say they have positive feelings about the candidate. Among whites that figure is 31percent. But results from the South Carolina Republican Primary suggest he does pretty well in counties with large minority populations. There are 28 counties in South Carolina where the white, non-Hispanic population is below the state average of 62.9 percent. Trump beat his state percentage in 25 of them. The other 18 counties, where the white, non-Hispanic population is above the average, he didn’t do as well. 3:30: Trump blasts the “disgusting press.” He says they “tell you what to do” and think and they are probably more disgusting than Cruz. 3:28: Trump slams Cruz for not disclosing his Goldman Sachs loans. 3:27: “We’re shaking things up,” Trump says after citing good poll numbers from Ohio and Florida. Trump says other candidates made their speeches and ran away. He tells the crowd that you shouldn’t vote for people who abandon you. Trump says “I’m going to be with you all night.” Trump asks people to stick around for a bit to watch if there are any shenanigans. Other than color, Obama did not – does not – share a heritage with the majority of black Americans, who are descendants of plantation slaves. Of course, the idea that one would be a better or a worse representative of black Americans depending upon his or her culture or ethnic group is clearly absurd. 2:42: After a federal judge questioned Hillary Clinton’s motives for setting up a private server/email account and declared that her top aides should testify, it is perhaps fitting that Clinton visited the set of Scandal last evening. Just to be clear, while my husband @SpikeLee supports Bernie Sanders @HillaryClinton is my candidate! We need Hillary to be the next POTUS! 2:33: On CNN, Maeve Reston said that the only hope Trump’s rivals have of upsetting him tonight in Nevada is if there is low turnout. 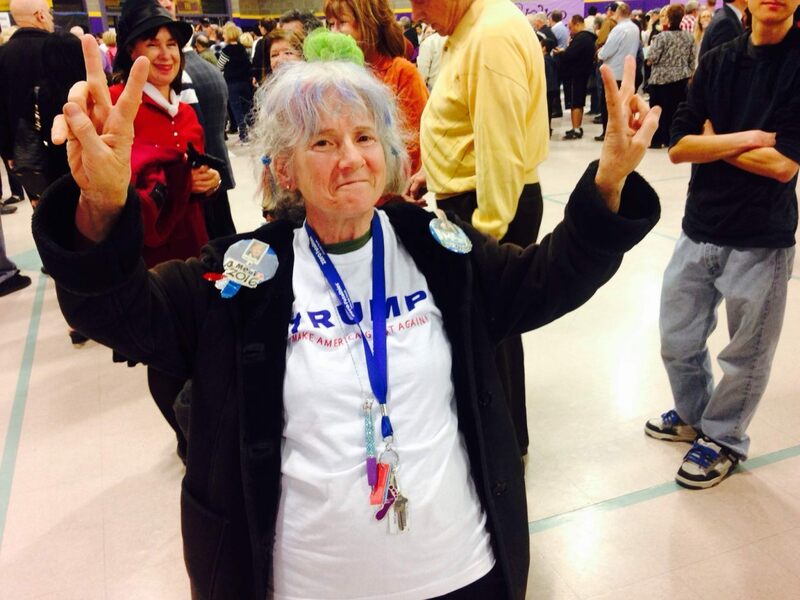 She said the enthusiastic crowds that are turning out to see Trump is a sign that Trump’s supporters will caucus for him. 2:22: Trump points out, unlike Rubio, he will be in Nevada tonight. He also points out that even Fox News has noted that some Bush supporters are supporting Trump. Great. 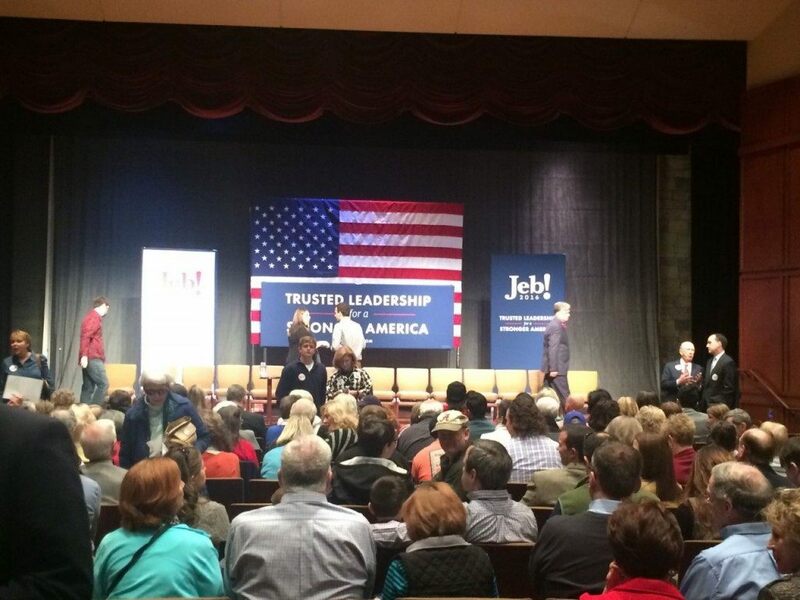 Just reported on @FoxNews that many people who supported @JebBush are now supporting me. I knew that would happen, pundits didn't! Unlike the other Republican candidates, I will be in Nevada all day and night – I won't be fleeing, in and out. I love & invest in Nevada! 2:15: Sanders going after Clinton’s ties to Wall Street. According to Kasich strategist John Weaver, the Ohio governor has worked out a plan with ACU organizers to attend. “Look forward to John Kasich at CPAC next Friday,” Weaver wrote on Twitter. “The only conservative running with a real record of accomplishment!” Weaver thanked ACU Chairman Matt Schlapp for the opportunity. 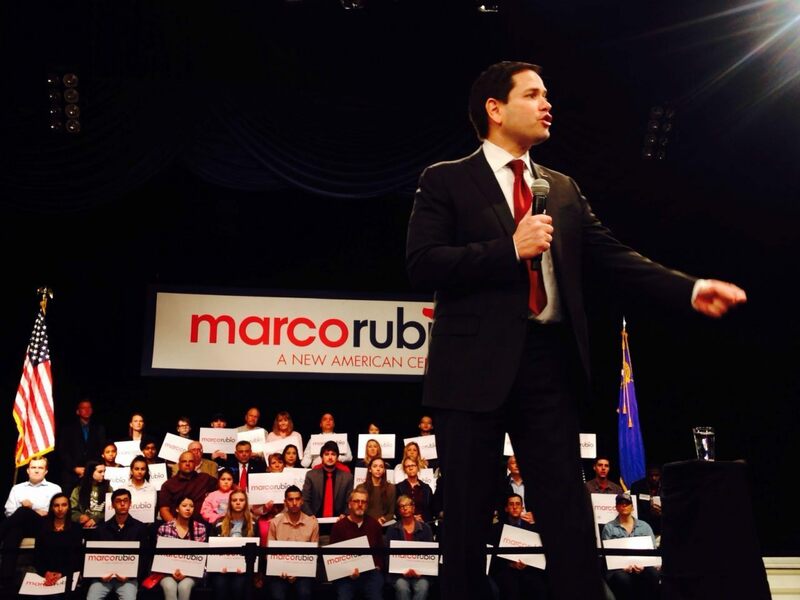 1:56 pm – Rubio targets Texas. 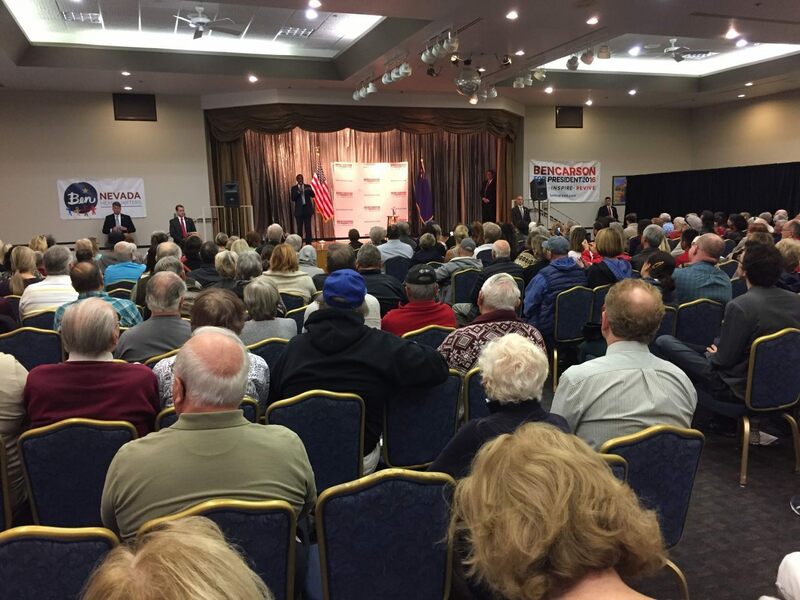 1:36 pm – Cruz hammering Obama’s plan to close Gitmo.
.@tedcruz at a rally in Fernley, Nevada: "Mr. President, don't shut down Gitmo. Expand it, and let's have some new terrorists there."
. @tedcruz reiterates his belief Obama wants to give the Gitmo base to the Castros "as a parting gift." As Mr. Cruz has elbowed into the top tier of candidates, his campaign has conspicuously reflected the brand of its principal architect: Jeff Roe, an operative with a reputation for scorching earth, stretching truths and winning elections. 1:22 pm – Cruz rally starting now. 1:18 pm – They mad. 12:59 pm – Photo: Adelle Nazarian. 12:56 pm – The full memo from Kasich bashing Rubio. Note that the subject is about “ROI” (return on investment). 12:51 pm – Matthew Boyle reports that Marco Rubio won’t be attending CPAC this year. Although, Marco Rubio has built a conservative record and has a high ACU rating, he and his campaign have made a rookie mistake. Today the Rubio campaign informed ACU’s chairman that their candidate is unwilling to make time to meet with activists and answer their questions at CPAC 2016. 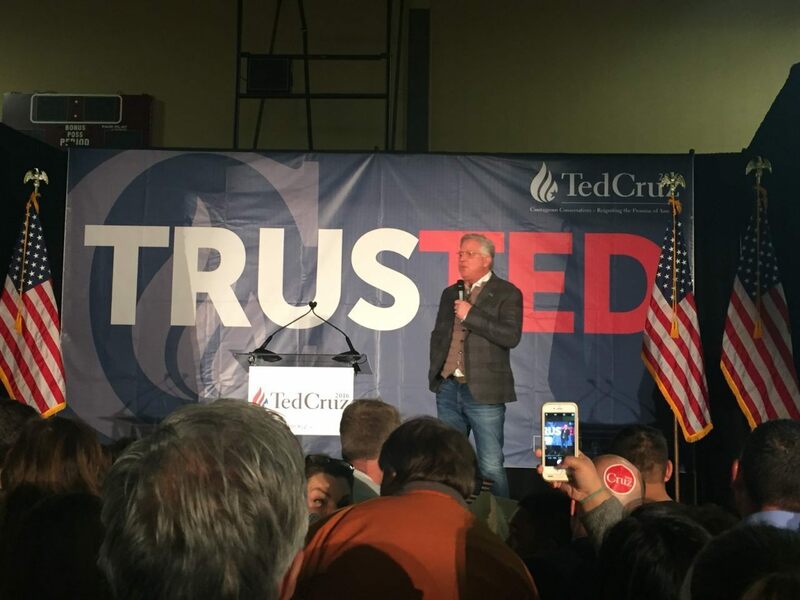 12:46 pm – Huffington Post says Glenn Beck has told Ted Cruz crowds he owns George Washington’s copy of Don Quixote–but that is likely false. 12:34 pm – Ohio newspaper gives Kasich’s rationale for staying in the race to become the favored establishment candidate. The Marco Rubio campaign touted big donors and endorsers including former presidential nominee Bob Dole and former Minnesota Gov. Tim Pawlenty. The John Kasich team touted fewer new endorsements and billionaire backers, but countered with polling that showed the Ohio governor locked with Rubio in some upcoming primary states. At stake: the title of the Republican establishment’s choice, tasked with taking on frontrunner Donald Trump. The Rubio campaign argues their man has already earned the mantle with his better-than-expected second place in the South Carolina primary Saturday, which prompted Jeb Bush to abandon his presidential bid. Team Rubio’s sentiment: Kasich has no chance and should drop out, and soon. The Kasich campaign argues no one has won the title yet. Only three states have voted, after all, and Kasich and Rubio are separated by only five delegates. Kasich will beat Rubio in more moderate states and will win Ohio March 15, Team Kasich says. Still, the campaign is already staving off growing pressure to call it quits. Sen. Marco Rubio doesn’t plan to be at his own campaign’s rally tonight after the results of the Nevada caucuses come in, according to his schedule. 12:03 pm – Kasich focusing his fire on–Rubio! Kasich camp releases new memo on Rubio: "Marco Rubio stock is the ultimate insider bubble." FIX: Does Trump treat the press corps any differently off camera than he does on camera? Or does he still not interact with you at all — or very little? Johnson: We have very little interaction with him on a daily basis, but we occasionally get close. The Donald Trump you see in a small setting — a visit to a campaign office, a quick interview backstage, a lunch stop — is a different person than the bellowing, insult-throwing candidate you see on the rally stage. In one-on-one settings, he’s charming, softer spoken and rather relatable. While his nasty, mean comments get the most attention, he’s also capable of being overwhelmingly kind, almost to the point of being uncomfortably kind. I’ve interviewed a number of people who have spent a little bit of time with Trump — big-name endorsers, dedicated volunteers, police officers assigned to protect him — and all remark on how he somehow made them feel like the most important person in the world. 11:56 am – Start of the line for Trump’s rally. With Jeb Bush out, Donald Trump has widened his lead in the race for the Republican presidential nomination. The latest Rasmussen Reports national telephone survey of Likely Republican Voters finds Trump with 36% support, giving him a 15-point lead over Senator Marco Rubio who earns 21% of the vote. Senator Ted Cruz is in third place with 17%. 11:32 am – Rubio talks foreign policy, general election–and cracks some jokes. Ha. @marcorubio rips on #tombrady, jokes that why he didn't do well in NH.
.@marcorubio On aliens and UFOs "Just kidding, there are no aliens or UFOs in Nevada. 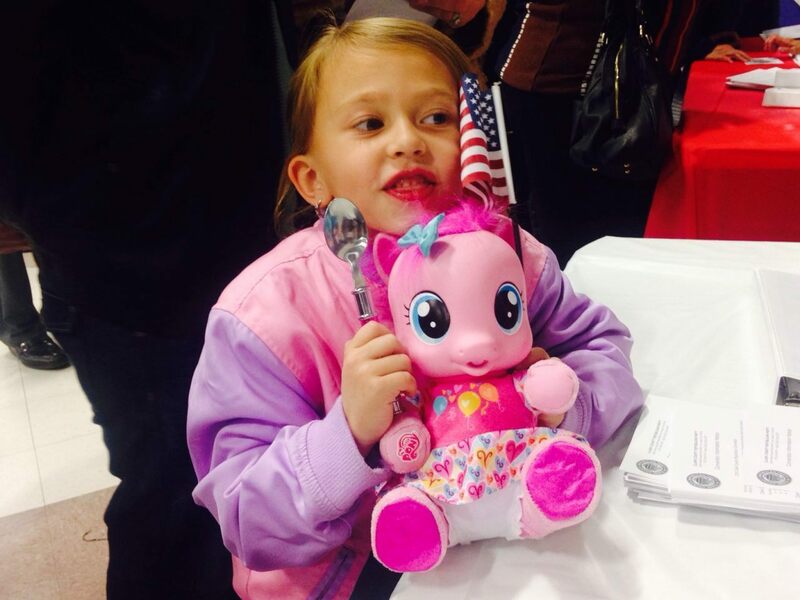 They're in Utah – or New Mexico." The politics here are genius. By making this very careful statement, Trump keeps the looming possibility of Hillary Clinton being indicted alive. Even if the Obama administration gives her a pass, as we all expect, Trump can drive the DC Media insane by keeping the indictment threat alive through the end of the general election. The idea of the Clintons finally facing justice for their sins will also keep the base excited. Once again, Trump is violating all of the DC Media’s rules that are set up to elect Democrats. Like Bill and Hillary’s sordid past with all of these women, Trump goes there and goes there and goes there. 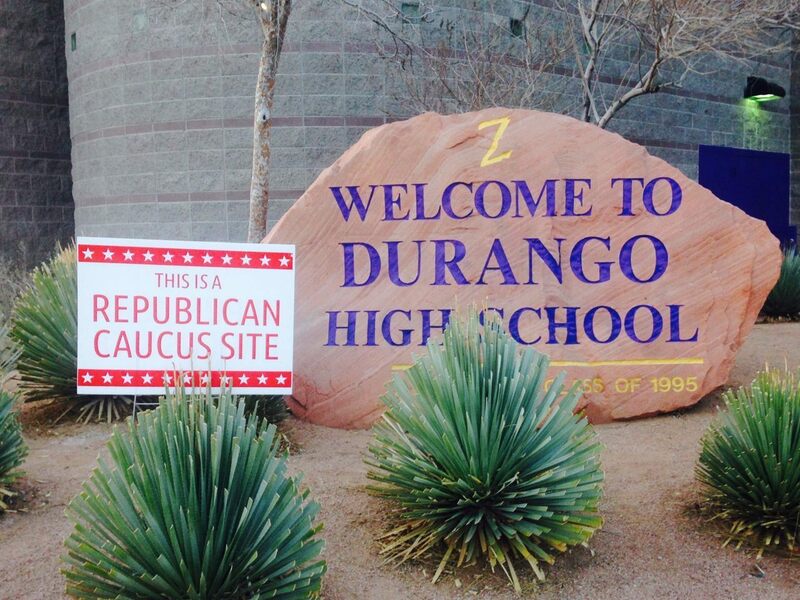 10:24 am – REMINDER: Nevada GOP caucus is tonight. GOP debate airs on CNN Thursday night. Super Tuesday is a week from today. Presidential politics is, at its core, all about math. Nowhere is that more true than in the fight for delegates to this summer’s Republican National Convention. And, the delegate math is close to conclusive: Donald Trump will be extremely close to the 1,237 delegates he needs to formally claim the party’s nomination by the end of the primary process. TRENTON — Gov. Chris Christie‘s now-suspended presidential campaign has sold its email list of supporters and donors to his former chief Republican rival Marco Rubio, the governor’s campaign spokesman confirmed Monday. That means those who supported the governor are now getting messages from Rubio, who was Christie’s prime target during the New Hampshire primary. The first e-mail message went out Sunday afternoon. 9:31 – Trump leads nationally in latest NBC News poll. A new NBC News/Survey Monkey poll finds Donald Trump still leading the GOP field nationally with 36%, followed by Ted Cruz at 19%, Marco Rubio at 16%, John Kasich at 8% and Ben Carson at 8%. 8:48 am – College paper compares Trump and his supporters to Hitler. 8:11 am – Latest polls out of Super Tuesday states. Trump leads in 9 states. Cruz leads in two. Rubio leads in none. Alabama: Trump up +21 in poll from August. On Tuesday morning, MSNBC’s Joe Scarborough declared Cruz dead. After spreading false rumors about Marco Rubio and the Bible, Cruz’s national spokesman Rick Tyler was forced to resign Monday. It was a very bad day for the campaign, and one that fit perfectly in the Narrative Trump and Rubio have crafted to portray Cruz as dishonest. Whether or not this means Cruz is dead, we don’t know. That is up to the voters not pundits. 7:55 am – Six states polled after South Carolina have Trump in double-digit leads. 7:42 am – Trump is up +5 in John Kasich’s home state of Ohio. Kasich, the popular governor of Ohio, comes in second with 26%. Ted Cruz is in third with 21%. Marco Rubio is way behind with 13%. Ohio votes on Tuesday March 15, along with another handful of important states like Florida (Rubio’s home state), Illinois, Missouri and North Carolina. Kasich is close enough in Ohio to encourage him to hold through Super Tuesday and into March 15. Unlike Rubio, as of now, Kasich can at least win a big state. Despite all the coalescing of the Establishment around the Florida Senator, Rubio only leads in Minnesota does not lead in a single Super Tuesday state. Kasich staying in the race complicates things for Rubio. 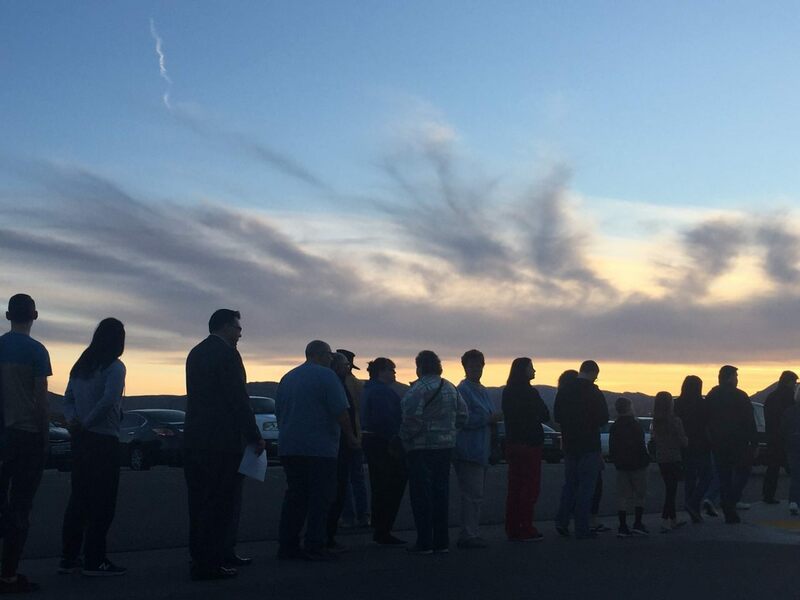 7:33 am – Nevada caucuses tonight. Trump has led in every poll, ranging from +13 to +26 points.